Dial Up Software without missing important calls - Internet Call Waiting with no monthly fees. Don't miss another call while online! Yes, you can stay online without missing important calls when you're using dial-up to connect to the Internet! 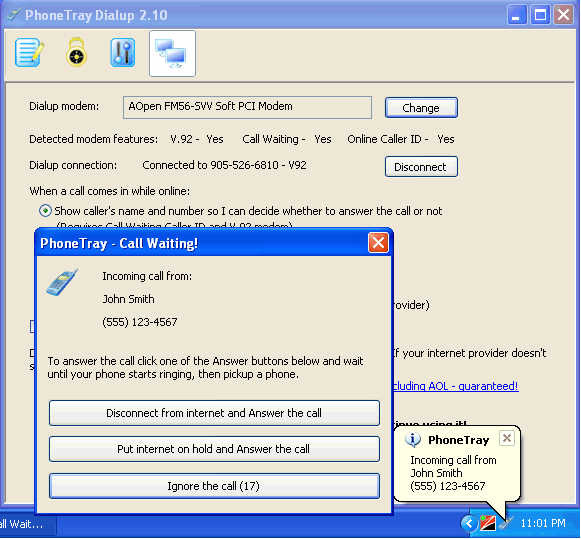 PhoneTray Dialup can notify you when someone is calling while you are online - with no monthly fees. You can choose to take the call or ignore the call. It's like Internet Call Waiting with no monthly fees, no ads and no spyware. Plus, you get full featured Caller ID software that shows and speaks callers name and number, logs all your incoming calls, blocks unwanted calls and zaps telemarketers. PhoneTray uses your modem to identify the callers before you answer the phone. You must subscribe to the caller id service from your phone company and have a CallerID capable modem. PhoneTray shows a balloon with the caller's name and number. The program also announces incoming calls using text-to-speech engine. You can set a different ringtone for each caller or type of callers. 20 ringtones are included with the program plus you can use any wav file. PhoneTray logs all your incoming calls. It keeps the date, time, name and phone number of each call. You can view a complete call history or calls received today, this week or this month. You can select what type of calls you want to see - all calls, local calls, long distance calls etc. Call history is stored in a standard CSV file and can be edited and exported to other programs using Microsoft Excel. Privacy Manager allows you to configure how PhoneTray handles incoming calls. For example, you can set PhoneTray to automatically answer all calls from private (blocked) numbers after first ring and play a message telling the caller to unblock his/her number. 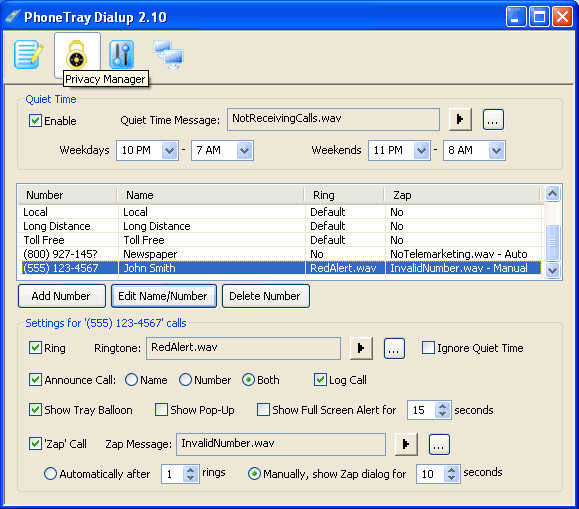 PhoneTray can automatically 'zap' telemarketers with a special 'number disconnected' tone. After receiving this tone telemarketer's computer will delete your number from its database. The program can play Federal 'do-not-call' warning forcing telemarketers to remove you from their calling lists - by law! AutoDial - A small Auto Dialer, auto dial and retry different phone numbers, help you get connected, a powerful automatic dialer software for you. Dialer 2000 - A Windows Internet dialer, will make sure your internet connection is always active, a power internet dialer for you. Amazing Dialer - Congratulations on obtaining Amazing Dialer, the most feature-rich and user-friendly dialing software for Windows. Quick3270 - A powerful, high reliable terminal emulator for Windows that connects PCs to IBM's zSeries (S/390) and iSeries (AS/400). RASMaster - Master your RAS (dial-up and PPOE) connections with RASMaster . SP Dialer - Advanced 3 in 1 solution - Internet dialer, time synchronizer and proxy server . Speed Master - Optimize your internet connection speed, Make High Speed Internet Connection, Internet Connection speed up easily. Innovatools Email Control - Regain control over your e-mail messages ! powerful email control software for you .